Dentists and “Wrongful Discharge” – What a Headache! In this survey, we asked dentists if they have had “wrongful discharge” headaches from past employees. The majority (72%) have not had such trouble. 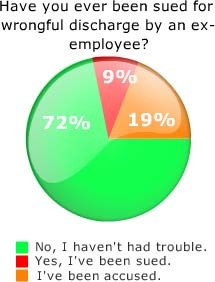 However, 9% of dentists report being sued for wrongful discharge, and another 19% say they’ve been accused of it.